The Software is designed in such a way that it export all emails stored in EML files to O365 user account without any limitations. Moreover, while exporting EML emails, it migrates attachments also associated with each email. Apart from this, the tool also allows users to migrate all EML emails to Exchange Online (Office 365) user account in bulk also to save time. The another attractive feature about the EML to Office 365 migration tool is that while importing EML emails data to Office 365 mailbox, the tool maintains all meta properties of the EML files. 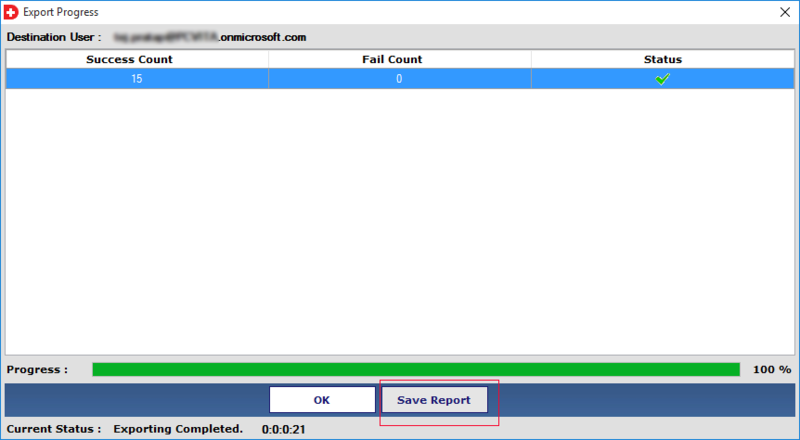 For example, it keeps size, date, attachments, subject, to, cc, etc., of the email intact as original after migration. Moreover, the tool is compatible with all version of the Microsoft Windows OS. Apart from migrating all EML emails, the tool also allows users to perform selective data migration. One can use the new date-based filtering option offer by the tool to export specific emails to Office 365 user account. A user just needs to specify the date range and the tool will export only that emails, which come under that specified date range. 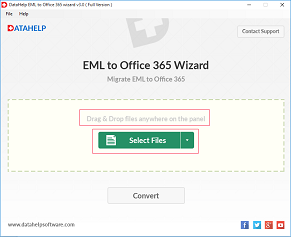 The EML to Exchange Online Wizard is programmed in such a manner that it prevents the confusion between the data by maintaining on-disk folder hierarchy into Office 365 user account. Moreover, the tool also ensures the integrity of data even after migration of EML emails to O365 account & support EML file of multiple email clients like Windows Live Mail, Thunderbird, etc. 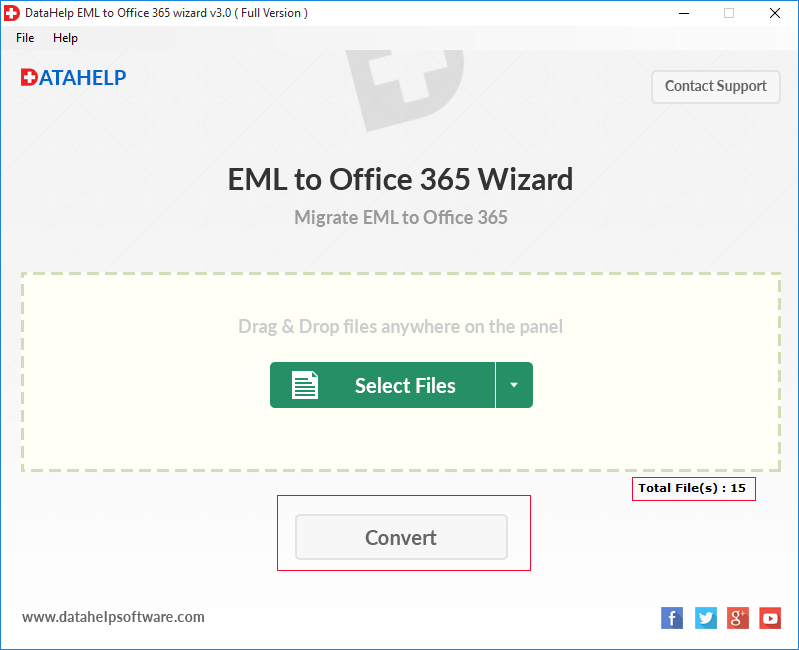 Using EML to Office 365 exporter one can import any size EML files to Exchange Online (Office 365) account without any trouble. The tool is completely free from any file size limitation. In addition, the tool maintains complete record of the migration process, including details of EML files and O365 user account and generate a report for future reference. In order to have an uninterrupted migration, the tool allows users to pause the process in between. It will be beneficial if there is an unreliable internet connection or stopped intentionally, which is easy to resume later on. As the process get paused, it can easily be resumed even after the application is closed and re-started again. There are multiple email clients available which are support EML files to store their emails data, one such email application is Windows Live Mail. this software will help you to migrate Windows Live Mail to Office 365 OWA. It is accurately export entire emails of WLM with their attachment into Office 365 account without affecting the integrity of data. 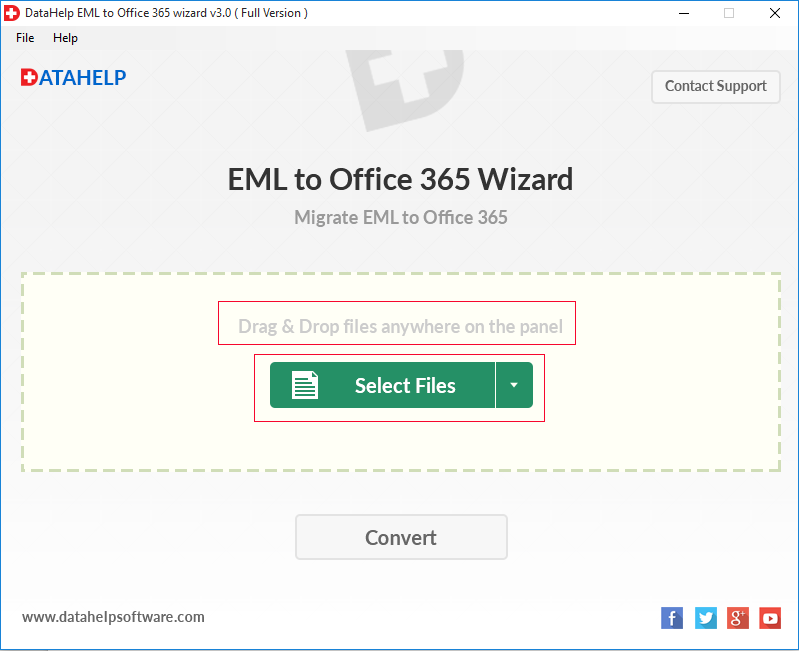 DataHelp EML to Office 365 migration tool allows you to export emails data of Thunderbird email application into Exchange Online (O 365) mailbox with attachments. This software independently works, you need to select Thunderbird email files (.eml) which you want to export into Office 365. 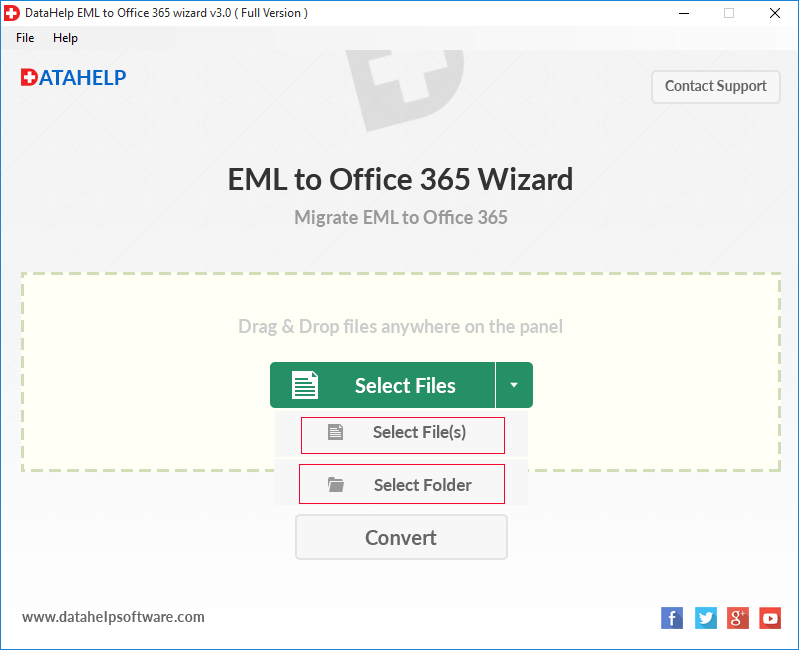 An additional benefit, this software lets you easily perform bulk & selective migration of Thunderbird, Windows Live Mail, etc.. emails (EML files) to Office 365 account. 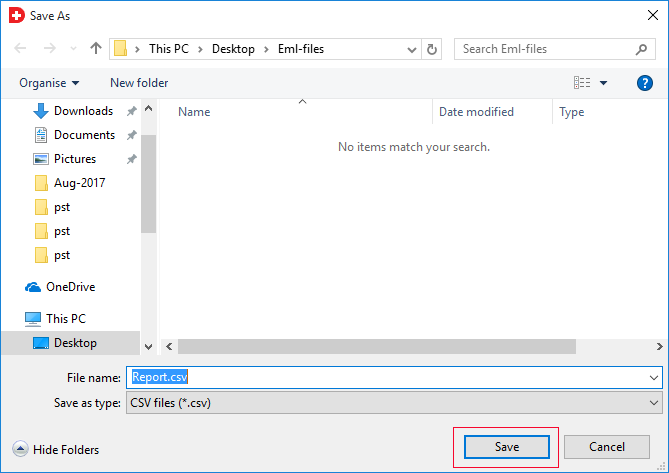 The software will keep all meta properties (header properties) in original format after performing bulk or selective EML files to Office 365 migration. 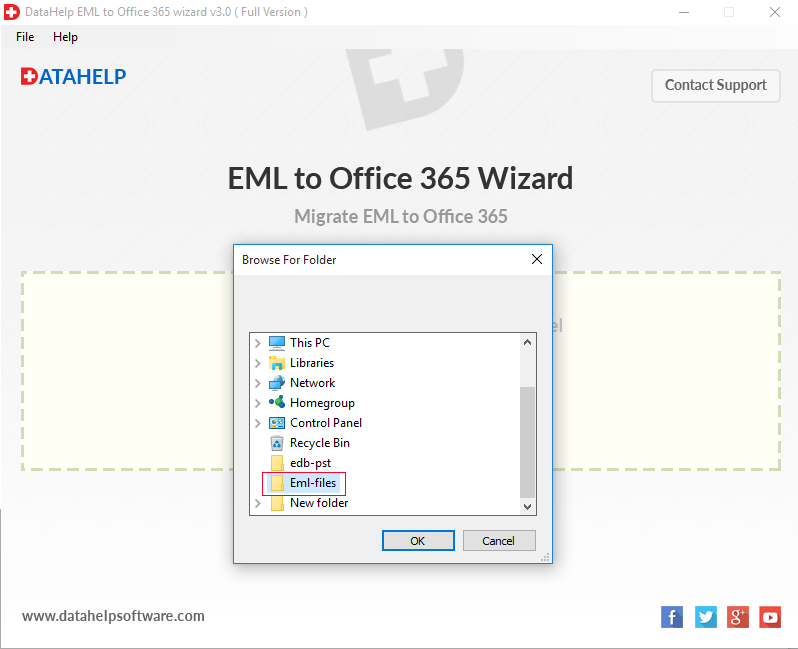 How do I migrate Windows Live Mail EML files to Office 365 with this tool? 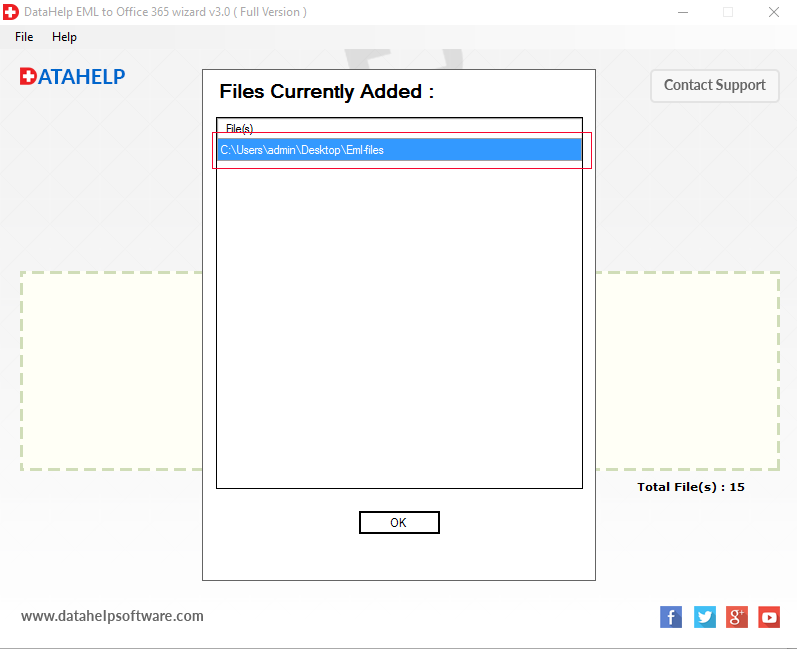 After completing process you will get entire EML files with their attachments into Office 365. By using this software you can also export EML files of multiple Email Client like Thunderbird, Outlook Express, etc. Does the software support EML file from any Email application? Yes, the software is compatible with EML file from any application. 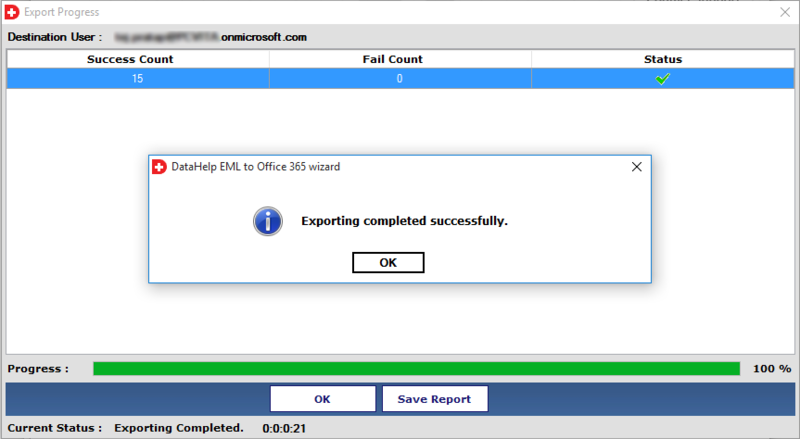 One can export any EML file to Office 365 account without any trouble using this software. It allows you to migrate EML of Thunderbird, Windows Live Mail to Office 365. This EML to Office 365 converter supports Mac OS machine? No, the software is not compatible with Mac platform as it is completely Windows-based and you can download, install and run on Windows OS. Can I export selective EML emails to Exchange Online user account? Yes, the tool provides date-based filtering option to migrate only selective emails from EML files to Office 365 mailbox. Is it possible to export multiple EML files to Exchange 365 account in bulk? 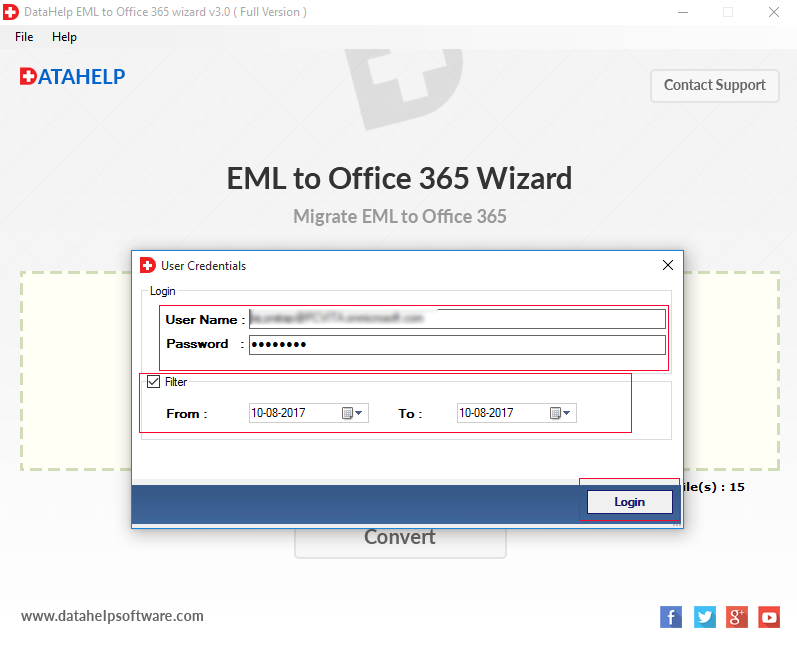 No, using this EML to Office 365 Wizard, a user can export multiple EML files to O365 account in a hassle-free manner. Does the software require any extra installation to migration successfully? No, the tool is designed in such a way that it does not require any extra installation to perform migration successfully. With this tool can I migrate Thunderbird Emails to Office 365? Yes, Tool support EML file of Thunderbird, Windows Live Mail, Outlook Express and other email clients. So with this tool, you can easily migrate Thunderbird Emails to Office 365 with entire data. "I am really thankful to the developers of this superb application because of the tool export all EML data to Office 365 account in just a few number of clicks. Moreover, the tool completes the process without any loss of data, which is my topmost priority. I liked this tool a lot and definitely going to suggest it to my friends also. Hats Off to the developer team!!" "The most attractive feature that I liked about this tool is the date-based filtering option to export selective emails EML to Online Office account. It was a great experience using this utility and I never thought that migration process of Windows Live Mail to Office 365 will be so easy using this EML to Office 365 wizard. Great work was done by the developers in developing such a user-friendly tool. "